This is a medical website. By continuing on this site, you are accepting that you might be confronted by material that may offend some people. What are Leg Ulcers and how are they treated? Leg ulcers are open, non-healing wounds of the legs. They are usually on the lower legs or the feet. They can be thought of as “open sores”. Ulcers can be painful or not painful. They can be big or small, wet or dry, smelly or not smelly. Leg ulcers can have many different appearances. Therefore, it can be very confusing if they are only assessed by their appearance. Many nurses and dermatologists use the surface appearance as part of their assessment – often leading to incorrect diagnosis and sub-optimal care (see below). There is little information that can be gleaned just by looking at the ulcer. However, a rare skin cancer called a Marjolin’s ulcer can be noted by seeing a “rolled edge”. So although not the most important part of the assessment nowadays, it is still essential to have a look at the ulcer itself. As stated above, there is very little that can be found just from looking at a leg ulcer in the majority of cases. Unquestionably, it is impossible to tell if a leg ulcer is curable or incurable just from looking at the surface alone. The word ‘ulcer’ means a break in the layer of cells forming a surface. This is called the “epithelial layer” and epithelial cells line any outside surface of the body. Hence ulcers can occur in many different areas of the body. Ulcers cause different problems depending on what surface they are breaking up. For example, a stomach ulcer is a break in the cells forming the lining of the stomach. This allows gastric acid to attack the underlying tissue. This can result in pain, bleeding or even perforation. A more common ulcer is a mouth ulcer. Most of us will have had one at some time. This is a break in the mucosal cells lining the inner surface of the cheeks. It allows saliva to get the underlying tissue and causes severe pain. In the case of leg ulcers, the skin breaks down and this allows air and bacteria to get into the tissue below. 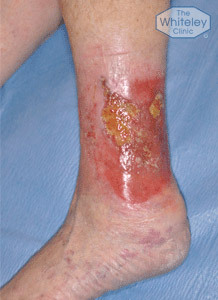 When an ulcer occurs on the leg, it is tempting to cover it up, hoping the skin will grow back. This is why humans, throughout history, have put dressings over leg ulcers, hiding them away and hoping they will heal. However, such simple actions miss out one major point. By covering the ulcer, the person doing the covering is not thinking about why the ulcer occurred in the first place. That is why we follow The Whiteley Protocol® In the protocol, we find the underlying cause of the leg ulcer using high-resolution duplex ultrasound. This is done by a The Whiteley Clinic trained vascular technologist. Once the underlying cause has been found, the protocol then points out the best route to curing the problem and hence the leg ulcer. We have now proven this at The Whiteley Clinic showing that we cure 85% of venous leg ulcers using The Whiteley Protocol. This is a permanent cure (not just “healing” with dressings), and 52% of patients never need compression again. are caused by veins not working properly – about 80-90% of leg ulcers. Most of these are due to the valves not working – varicose veins or “hidden varicose veins”. Often this also includes incompetent perforating veins although many surgeons do not treat these. At The Whiteley Clinic we invented the TRLOP technique (see below) and so all of our doctors treat incompetent perforating veins. Venous leg ulcers are treated by venous surgeons or phlebologists. Vascular (arterial) surgeons often fail to treat perforating veins or other more subtle causes of venous leg ulcers. Other venous causes include obstruction where the vein is narrowed or blocked, or stasis. Fortunately, these are uncommon. are caused by the arteries not working – about 5-10% of leg ulcers. Arteries take blood and nutrients to tissues. When they become narrowed or blocked, the skin doesn’t get nutrition. Although uncommon, arterial ulcers are easier to understand and to treat. They are treated by vascular (arterial) surgeons. are caused by rarer conditions – about 5% of leg ulcers. Such ulcers can be caused by infection, auto-immune diseases or connective tissue conditions, amongst other causes. Please note that specialists like the venous surgeons at The Whiteley Clinic, always check for other causes, such as arterial causes, before treating venous leg ulcers. This is essential as many leg ulcers occur in older people and they may have more than one cause for their leg ulcers. Until the 1980s, most doctors and nurses had a clear understanding of the difference between venous leg ulcers and varicose veins. Unfortunately, it turned out that they were wrong! When valves failed in the superficial veins, they swelled on the surface causing varicose veins. They believed that the deep veins could not be treated and so the only way to treat venous leg ulcers was to wrap the leg in compression bandages and dressings. They also believed that the superficial veins caused no inflammation. Although they could be treated by varicose vein surgery, there was no need to do so as varicose veins were “only cosmetic”. They believed in only 2 systems of veins in the legs – the deep and superficial systems. The deep veins were in the muscles. The superficial veins in the fat under the skin. When valves failed in the deep veins, this resulted in inflammation at the ankles. After a time, this inflammation would accumulate until the ankles swelled, the skin turned brown and leg ulcers appeared. It is a great pity that many doctors and nurses still believe this, as it is totally incorrect. This error has resulted in patients with leg ulcers failing to get the right treatment and ending up in compression for years. It also resulted in patients with varicose veins being left untreated, deteriorating towards complications such as leg ulcers in the future. In the late 1980’s, a new test called Duplex Ultrasound was invented. Duplex ultrasound allowed us to see the veins, and also see the blood flowing within them. Researchers using duplex ultrasound quickly found that the previous understanding of venous leg ulcers and varicose veins was completely wrong. Research published in the 1990s showed that most venous leg ulcers were caused by superficial vein reflux. Previously, it had been thought that when the valves failed in the superficial veins, the superficial venous reflux that resulted only casued varicose veins. The valves failing allow blood to fall the wrong way down the veins – a process called “reflux”. This reflux was thought to stretch the wall of the veins, causing varicosities. However, this new research found that the majority of venous leg ulcers were caused by superficial vein reflux. Deep vein reflux alone was found in only a minority of cases. Even more interesting, many of the patients with superficial vein reflux did not even show varicose veins on the surface. This gives the term “hidden varicose veins”. Developments since have been equally valuable. There is still no easy way of treating deep valve failure. Conversely, we treat superficial valve failure with ablation. Introduced into the UK in 1999 by Mark Whiteley, the ablation of superficial venous reflux is highly successful even in the long term. We have now shown our 15 year success rates in a study published from The Whiteley Clinic. This is excellent news for our patients at The Whiteley Clinic. Provided the patient can walk, most are now curable. Research has continued. Deep vein reflux is usually secondary to a deep vein obstruction at a higher level. Placing an expandable metal tube called a “Stent” through such obstructions, opens them up and holds them open. Therefore in many cases, even deep vein problems are now curable. As such, no patient who can walk should ever accept long-term dressings and compression for a leg ulcer unless they have been fully investigated by an expert team. 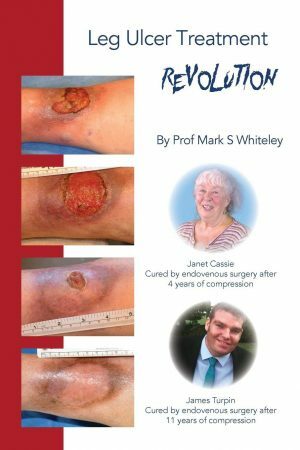 If you want to know more about venous leg ulcers and how they can be cured permanently, see “Leg Ulcer Treatment Revolution” published in November 2018. This is available on Amazon and in good bookshops.